Push to Choke. Boat Marine. Ignition Starter Switch. 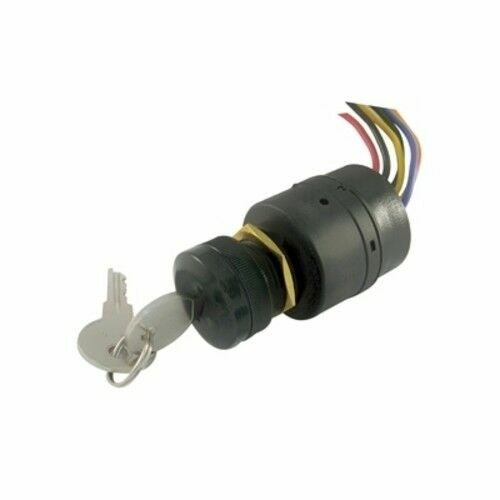 Push-to-Choke Ignition Key Switch. Replaces 87-88107, and 87-88107A5. • Use with Magneto Ignition. Replaces OE# 87-88107, and 87-88107A5. 6 purple ignition. This arrived four buisness days after purchased. Simple and straight forward installation. I had it hooked up in no time. Also comes with a waterproof seal. my 40hp mercury was not keeping battery charged. I tried different type of switch and still no charge. I purchased this one and it works now. The fit was exact and having the color coded wires made it a snap to install. Bought this ignition to replace broken aftermarket. To fat to fit in control box so I shaved the extra plastic around the unit and now it's a snug fit! Could see the key slot getting worn fast though. Still a lot better starting with a key rather than a pair of pliers. Hi the key switch was easy to wire up the color codes were easy to fallow and it works great.